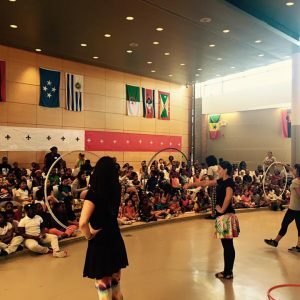 We bring the Hoopla to all enrichment programs, pre-schools, Family Fun Nights, Healthy Kids Days, and any organized event where having FUN is the key. Our programs are created for grades Pre-K thru 8 and customized based on grades, ages and abilities. In all programs, we discuss the importance of healthy minds and heathly bodies while teaching students to use the hoops as a form of play and exercise. Encouraging and spirited instruction supports each child’s confidence and self-esteem to ensure a successful and empowering program for everyone. BringtheHoopla has been offering programming since 2011. We work with schools, troops & clubs, assisted living facilities, senior centers, skilled nursing centers and non-profit organizations. Each session is a minimum of 60 minutes and our focus is on increasing self-confidence through positive activity. 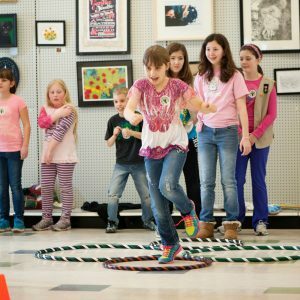 Whether it is a Family Fun Day or 5K race, or a Girl Scout troop, we can get you in the spin by one of our many offerings. 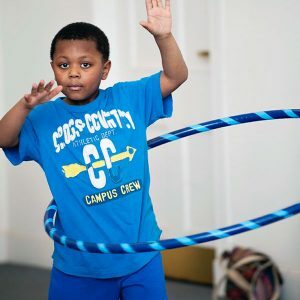 A multi-function hoop class that combines physical education with building cognitive learning and motor skills. We focus on colors, counting, balance, rhythm, and hand-eye coordination activities while exploring imaginative play and movement within the hoop. A high energy hoop class where we practice a variety of hoop games that build stamina and focus, increase flexibility and foster team-building, leadership and cooperative play. 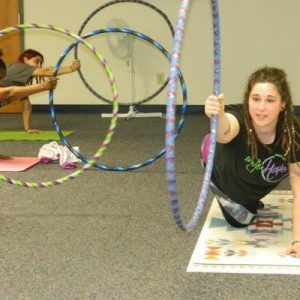 We teach on and off body hoop tricks and techniques while offering individualized instruction to create an exciting class for all hoopers. 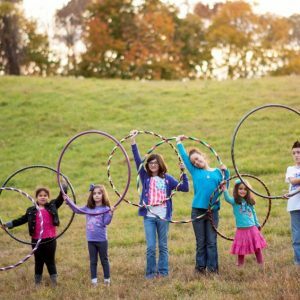 BringtheHoopla offers a high energy show with comedy, hoop dance performances and audience interaction. Our primary theme is healthy minds, healthy bodies. BringtheHoopla inspires active and healthy lifestyles, self-expression and a positive activity that makes us smile from the inside out. We bring the FUN back into fitness. Cost begins at $399 for 55 minute assembly. Our library program was created to keep in line with the CT libraries theme for this year. 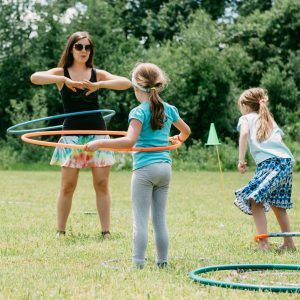 We create a welcoming environment, provide music and sound system, and allow each participant to find success within their hoop through (hula) hoop instruction, engage through age appropriate games and team building activities and encourage self-expression and creativity. Field Days are one of our specialties! Whether we are one center among many or the culmination program of the day, we will get everyone hoopin’ on your Field Day! Field Days include two Hoopla team members that teach basic instruction into beginner skills and finish off with an obstacle courses. Perfect for ages K & up! Cost begins at $199!Custom Packages Available! A perfect place for any level to work on toning and strengthening core while expressing their inner self through dance. We focus on increasing flexibility, focus and stamina while toning glutes, thighs, arms while creating your own hoop journey. This energized class is designed for letting loose, finding your flow and burning up to 500 calories in an hour. In this class, you will stretch and strengthen in traditional Asanas in a new way, by using the Hula Hoop as a prop. Hula hooping opens the hips and strengthens the core. 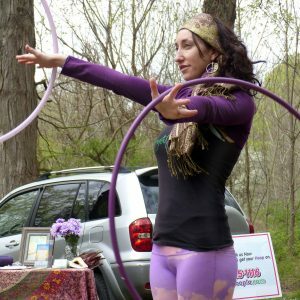 Hooping tricks and techniques will also be taught in this class, to increase energy and experience greater range of motion in the joints. This class is fit for all levels, with many modifications provided throughout the class. 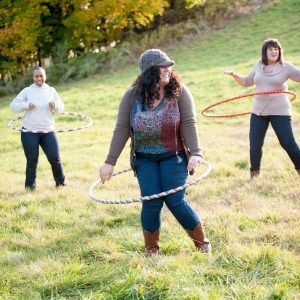 No hooping experience is needed, and Hoopla Hoops will be provided. Prefer learning one-on-one? Whether you are a beginner hooper or advanced, we tailor our private lessons to your ability, skill level and focus on what you would like to learn.